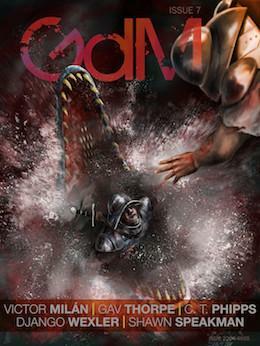 Bit of a departure today from the usual Relentless Positivity theme – Grimdark Magazine is an ezine dedicated to the grey end of the fantasy and SF spectrum, where the characters are morally compromised, the choices are bitter, life is cheap and everything comes at a price nobody wants to pay. If you’ve never heard the (usually at least slightly ironic) expression “grimdark” before, it’s squarely centred on the works of Jo Abercrombie, Mark Lawrence and SFF’s Grandpappy of Murdering Your Favourites, George R R Martin. You know, books where the hero gets his head cut off or the one more or less noble character dies slowly, consumed by alien spores, wasting away from some kind of magic radiation leak or developing gangrene from an untreated scratch from the sword fight he won in the opening scene. I’ve been working my way through the eight issues of GdM issued to date – which I got in a bundle for supporting their “Anthology of Antagonists” Kickstarter – and I’ve been very impressed. The stories are mainly grim and gritty fantasy – light on magic and heavy on the ruthless bastardy and sudden murder. Here and there light doses of science fiction are thrown into the mix – Warhammer 40K-style future warfare, noir-tinged cyberpunk and the like. Each issue is also well supplied with book and movie reviews, essays on what is and isn’t grimdark (and related subjects), and excerpts from upcoming novels. Not everything in each issue is to my taste, of course – I bounced off a few of the stories for various reasons.But even the stuff I didn’t like is well-written and engaging – there’s a quality editorial hand on the tiller here. If you have any interest in consuming your fantasy with a heavy sprinkling of salt and ash, you’re bound to find something worthwhile in GdM. I’ve already added a couple of new-to-me authors to my to be read pile based on their contributions. A discounted bundle of articles, interviews and short stories – including one excellent yarn by my mate T R Napper – is available from the GdM site [BUNDLE DEAL]. Give it a shot – but if you do, for goodness sake clean that sword wound before you catch something nasty. This entry was posted in Relentless positivity and tagged george r r martin, grimdark magazine, joe abercrombie, kickstarter, mark lawrence, t r napper, warhammer 40K. Bookmark the permalink. Hmmm, I’m undecided on this one. I do read dark fantasy, but more the psychological, disturbing end than the blood splatter end. What’s the ratio, would you say? Not usually too splattery, though the violence tends to be in the visceral Gladiator-ish region – brutal and uncompromising rather than necessarily sadistic. In terms of the psychology, the emphasis on morally grey, survival-oriented protagonists. In the fantasy stories, the magic tends to play second fiddle to the ruthlessness of the characters in the pursuit of their (sometimes awful, sometimes sort of altruistic) goals. I mean, it’s basically fantasy (or science fiction) noir, in the Raymond Chandler/James Ellroy pessimistic mode. Sounds like there would be plenty to keep me occupied. Now I just need more time to read all these wonderful creations!